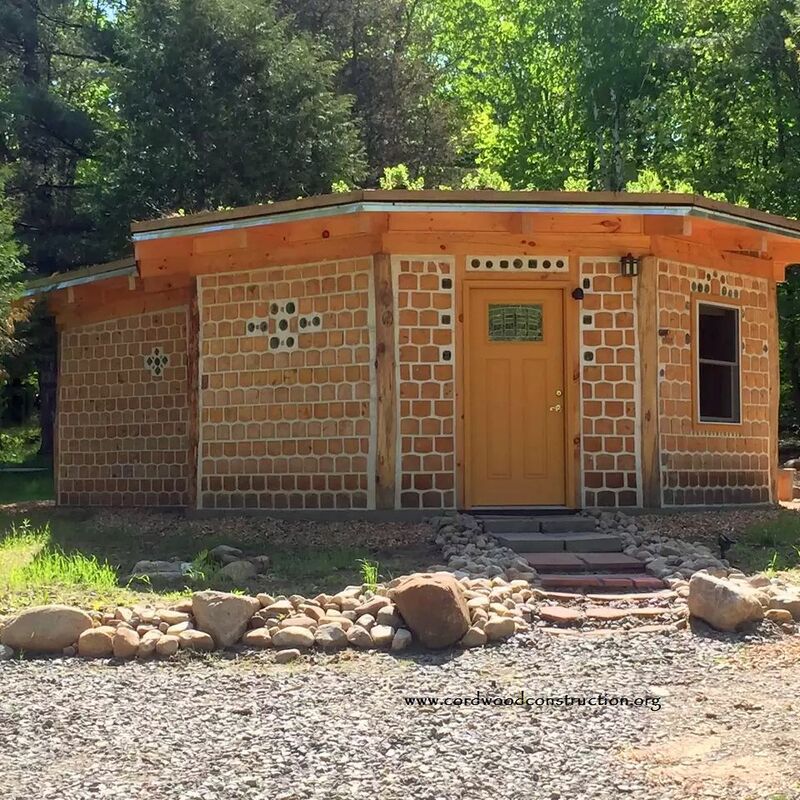 Rarilee & James Conway built this beautiful airbnb cordwood Bed and Breakfast in the Adirondacks of upstate New York near Whiteface Mountain. Rarilee used the Stoneview style project as a way to provide extra income for the family and involve them in a meaningful project. Rairlee says: “We built this unique cabin by hand using locally sourced eco-friendly materials. 22′ diameter octagon w/ 8′ x 8′ bathroom (tiled shower & compost toilet). 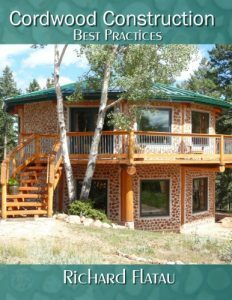 Timber frame structure, cordwood walls & living roof. Bottle logs add color & creativity. Full kitchen, charcoal grill & fire pit. Linens provided. Comfortably sleeps up to 3 w/ queen memory foam mattress & single futon. Shed is available for ski/bike storage. 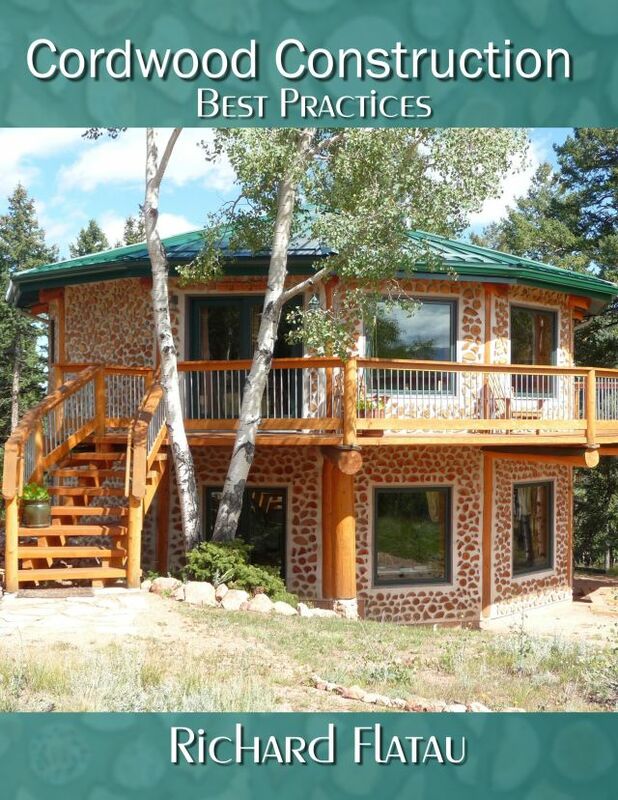 Easy, close access to ski, fish, hike & bike. You can hear wolves howl too!” Inside it’s cozy, warm and relaxing. One of the reviews from someone who stayed at the cottage. 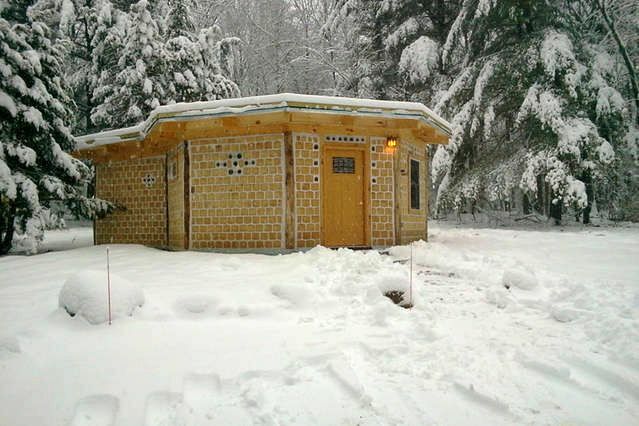 “The Adirondack Cordwood Cabin is a little slice of hand-crafted, charming, mountain paradise. 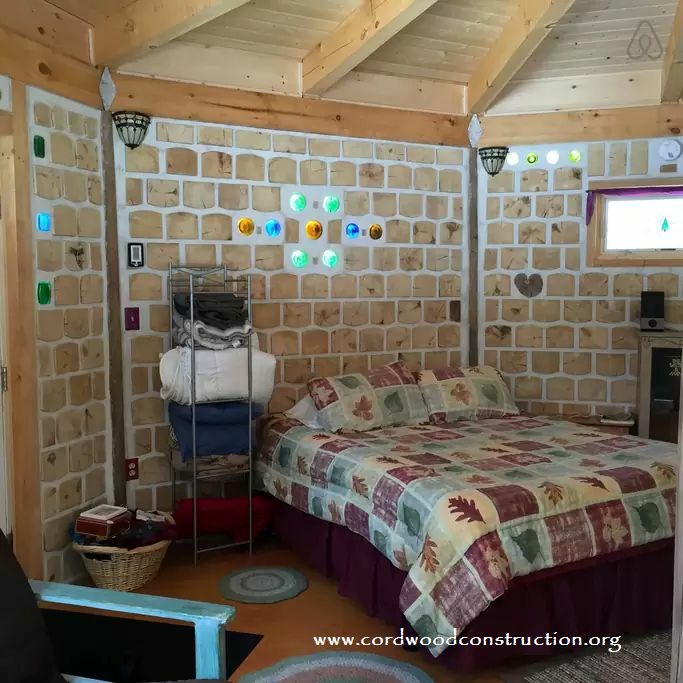 The cordwood construction with colored glass highlights and gorgeous exposed beam ceiling make this space feel magical and timeless. One may be struck by the thought of being in some Tolkien world as they gaze out at deer nosing at the ground amongst the pines all around and feel at peace in this little hobbit abode. There’s also all the modern comforts one could want for a perfect couples getaway. Gas woodstove, which keeps the place nice and cozy, superbly comfortable bed, well appointed kitchen suitable for any meal preparation one could imagine, reliable wi-fi, composting toilet (super cool), stereo, and lots of serenity. The wildlife refuge across the street is a really nice perk, and the cabin is situated well within driving distance of the high peaks and lake placid. 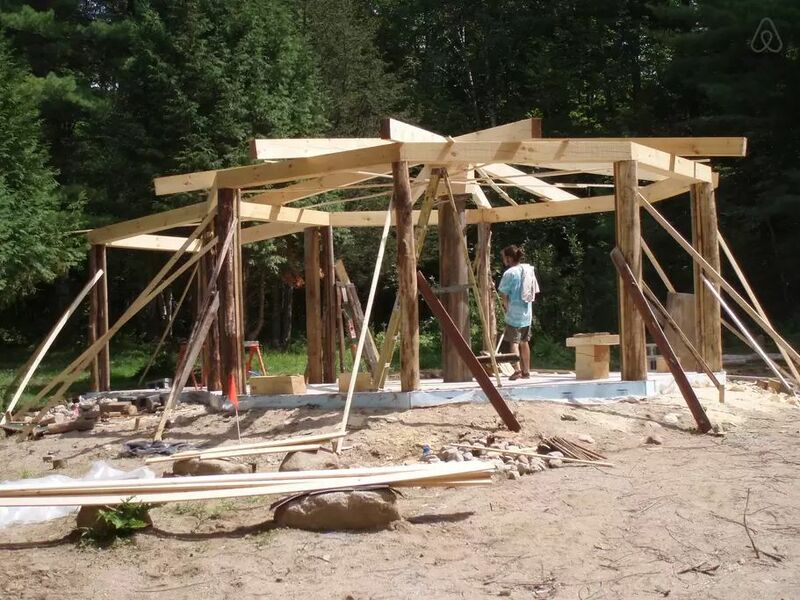 Will likely be visiting again.” The framework is post and beam with a center bearing post. It’s also beautiful and attractive during the summer months. 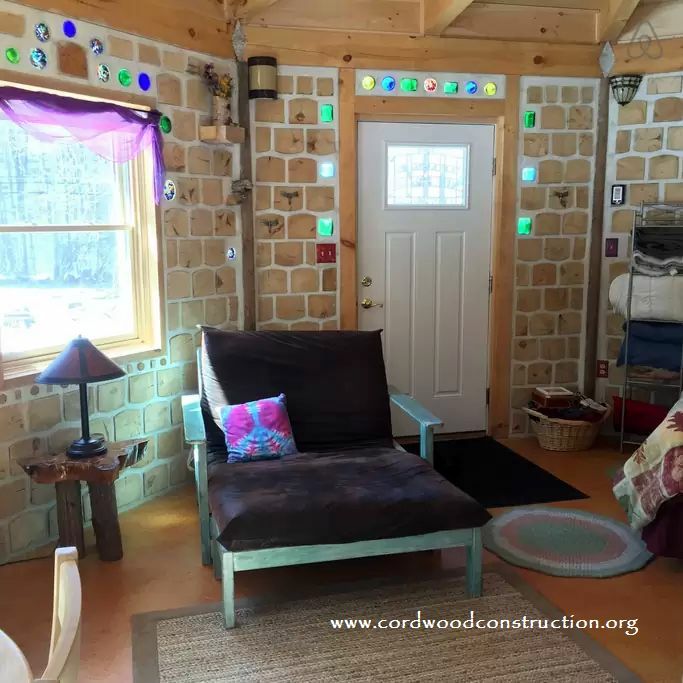 Rarilee also wrote a wonderful article in the Cordwood Conference Papers 2015 about her project and provides a detailed materials list in her essay Adirondack Cordwood Cabin. 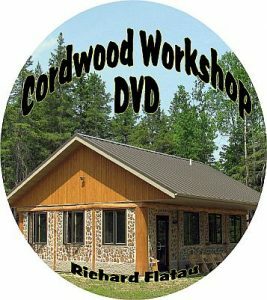 The Papers are available at the Online Cordwood Bookstore.